To better understand and address unmet health needs in rural communities throughout the country, the American Heart Association partnered with verynice to develop a toolkit and build capacity around a more human-centered approach to research. Through reviewing existing design research methodologies, learning from a diverse array of experts about the importance and use of listening, and piloting this framework in the rural town of Salinas, CA, AHA and verynice were able to refine a process that could be easily adopted by staff and adapted to the unique needs of other communities. This bottom-up approach marks a significant shift in an organization that traditionally has operated top-down as a leading expert in national health policy.This project is about an ongoing collaboration between the American Heart Association and verynice to shut our mouths, widen our eyes, and open our ears. 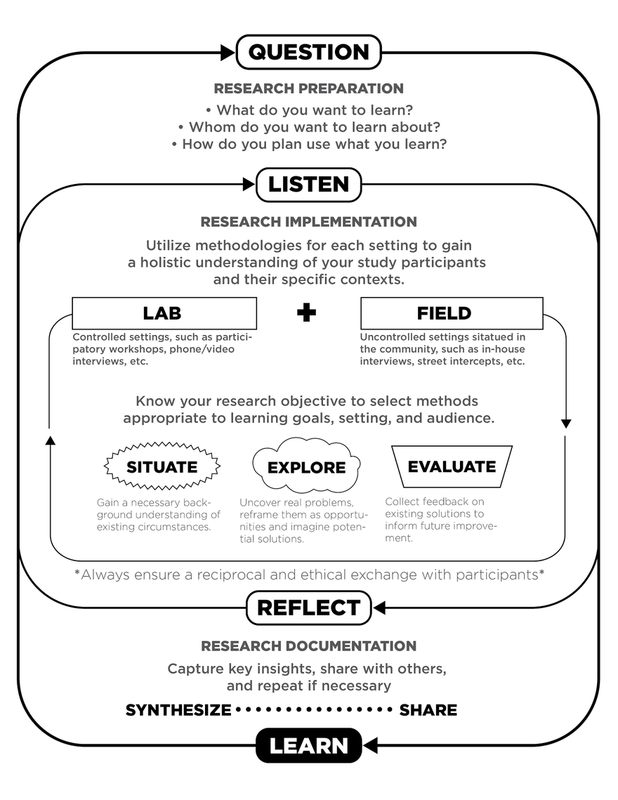 This framework was designed to allow teams at AHA to be clear about their purpose, stage, and scope of community-based design research. Starting with exercises as simple as drawing what you have in your refrigerator, helped lead to greater findings about food preferences, availability, and other health related issues. Worksheets were a last minute inclusion given our shortage of Spanish speaking facilitators. However, these turned out to be a huge advantage in documenting the workshop and sharing the results. Collectively map each participant's journey on the wall helped spark a larger group discussion about similar patterns and differences. • Understand the assets, needs, and circumstances of rural communities as they relate to health. • Align AHA's scientific understanding of health with a more human-centered perspective. • Build staff capacity in more qualitative, design research and rapid ethnographic methodologies. Therefore, we set off to build not just a design research tool for AHA to get to know its constituents and their needs better, but a process for research that could be easily understood, used, and shared throughout the organization to encourage this new line of inquiry. Even by starting small, this project had the potential impact of helping AHA better address the needs of rural communities throughout the country. Knowing that this could not be a one-size-fits all type of approach, verynice collaborated with AHA to develop a process that was structured enough to guide teams, but flexible enough to fully account for different use cases and communities. After a thorough review of various qualitative and design research methodologies and resources, as well as hearing from experts in a diverse array of fields (e.g. social worker, journalism, facilitation, entrepreneurship, and music) about the importance of listening, verynice created a simple framework to guide AHA's community-driven work. This utilized a collection of existing methods and new approaches, but recontextualized them to be the most actionable for AHA. Quite simply it states that to Learnwith any community, AHA must Question, Listen, and Reflect. Each stage of the process is outlined below. Question - This is a crucial stage focused on Research Preparation. Not only does it ask teams to consider what they what to learn and from whom, but equally important, it questions what they plan to do with that information. Listen - After answering those critical questions, then and only then can a team move onto Research Implementation. Here a team can select and utilize methodologies that help it achieve the objectives of situating itself within a new context, exploring unmet needs, and evaluating potential solutions. Reflect - After implementing the research, comes research documentation. This stage is included to help teams make sense of their findings, synthesize insights, and share them with their others to consider next steps. As an iterative process, this is also a stage where it is important to check if the original research questions (i.e. the purpose of the study) has been adequately addressed or if new ones came up. 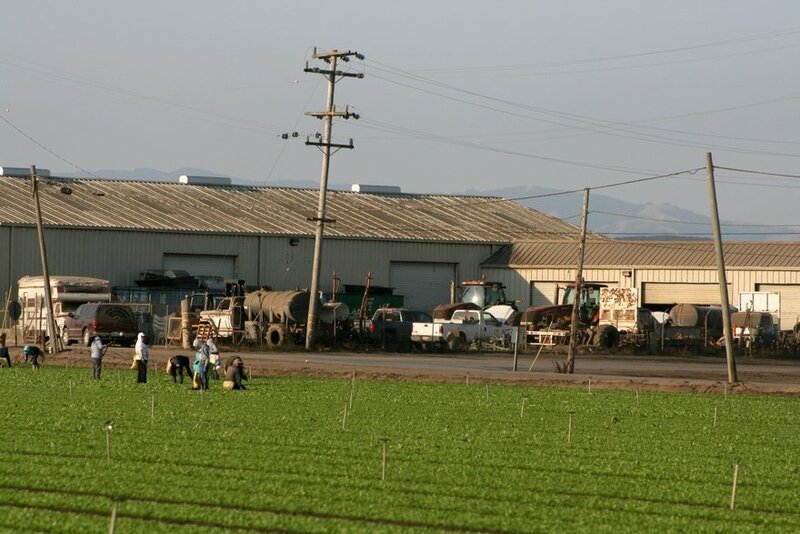 To test the methodology, verynice collaborated with the AHA in conducting an initial pilot study in Salinas, California, which is a rural, largely agricultural community in northern California. On Friday, September 01, 2017, verynice lead a participatory idea generation workshop at the Alisal Family Resource Center. In this 2 hour interactive workshop (2 hours), facilitators guided 14 Spanish speaking participants through various activities to learn from the solutions that participants create themselves. The language is important to note as it was just another lesson for the importance of localizing the toolkit and the methodologies. 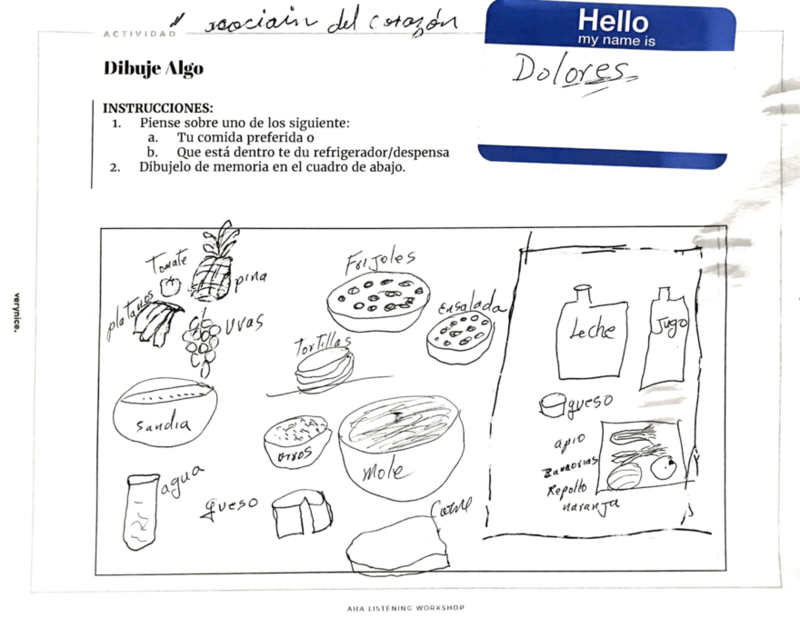 Using food as a simple universal topic, the first activity had participants draw their favorite food OR the contents of their refrigerator. Following the activity, a couple of people were invited to stand up and share with the group. While this exercise was the most straightforward, the combination of a simple topic and sharing component acted as an icebreaker. Each participant individually filled out completed worksheets in order to log information regarding their process of acquiring food as well as to indicate the party responsible for the task, and the relative ease/complexity of the task. Once all participants were done populating their worksheets, the lead facilitator solicited a volunteer to come to the front of the room. 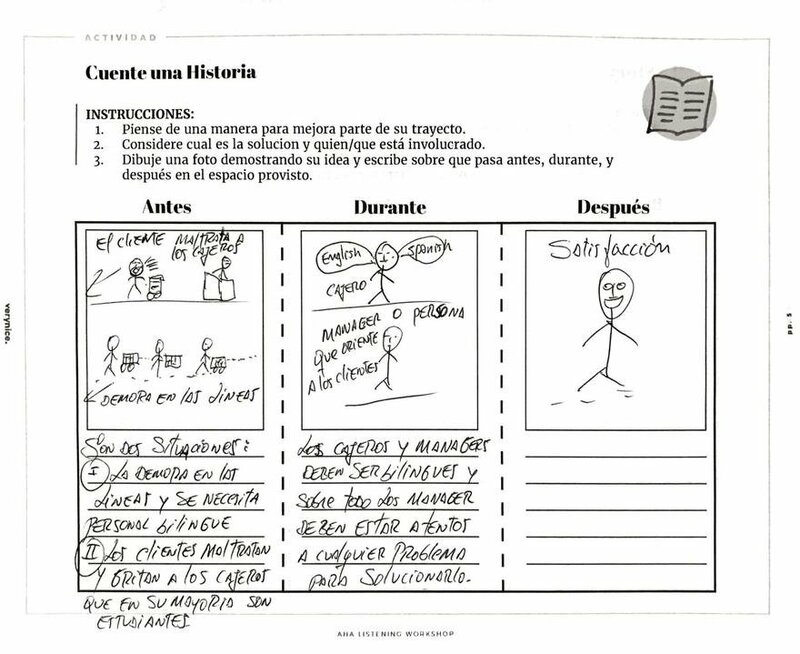 Together with the volunteer, the lead facilitator plotted the participant's answers on the pre-drawn journey map. Once completing the sample, all participants were invited to the front of the room in order to plot their responses. Next, participants were asked to select the point of their journey they dislike the most, and complete an empathy map inspired by that low point. The purpose of an empathy map is to allow the participants to reflect on the pain point by describing in detail their feelings, as well as what they were hearing and seeing the last time they experienced said pain point. The final exercise, inspired by all previous activities, asked participants to invent a new solution (potentially informational materials, programs, or initiatives that the AHA could initiate) that can reduce the negative aspect(s) of their journey. At the end of the exercise, a selection of the participants will share their solution with the group in order to close out the day. Through these simple activities centering around food, the conversations quickly zoomed out of the fridge and into much broader territory. One participant shared that although she works on the fields harvest fresh produce, that that same produce is not available or affordable to her and her family. But we also heard about the triumphs that some single males had found in partnering up to go shopping and cook together as a way to ease the effort and cost involved. Apart from these anecdotal findings, the group by and large shared how their candid appreciation for AHA to come not with answers, but with questions, ready to listen. For both AHA and the community members that participated in Salinas, the lessons learned are only as important as the actions they inform. Not only is AHA planning a return visit to Salinas in order to start co-creating some solutions together in a sort of community-driven health hackathon, but also there is a wide number of ways in which this work has begun to spread. After each workshop, AHA adds to its growing body of research to share with its teams spread across the country and refines the framework and methodologies further. Leveraging the Toolkit for Urban Communities - Presented with the opportunity last fall, verynice and AHA partnered with Nicole Chan's Design for Community Change class at Santa Monica College (SMC) to explore the issue of food deserts in South LA. In this collaboration, the first cohort of SMC's interaction design students got to treat AHA as a client and leverage the framework developed by verynice to get out of the classroom and into the community. Listening within the AHA - On September 29th, verynice facilitated a panel discussion with 4 experts on listening at AHA's Los Angeles offices. Panelists included: Marlon Fuentes (VR Producer & Ethnographer), Austin Bauer (Career Coach), Marya Bangee (Grassroots Organizer & Strategic Consultant), and Rosy Serrano (Clinical Social Worker). In all, this project recognized that to be heard and to listen are two tremendously rewarding gifts for all parties involved. Within the broad category of health in America, many of the communities that are disproportionately served are the ones which few organizations or services committed to truly hearing their needs. This project is an ongoing collaboration between the American Heart Association and verynice to shut our mouths, widen our eyes, and open our ears.